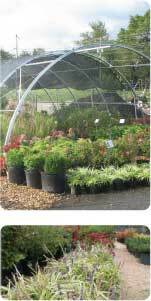 We have several varieties of mulch available and currently stock thousands of shrubs and trees. We are currently open (March through October) Monday through Saturday from 8am to 5 pm or by appointment at any other time. Call us at 540.432.7300. It's that time of year... Mums are here! *Use our Quantity Calculator to figure out how much you need for your job HERE. We receive regular plant shipments; give us a call if you require something that's not listed here, it's likely we may already have it on site or we'll gladly order it for you. Metal Landscape Edging: 4" Steel U Spikes, Green or Black. Pete Moss 3.8 cu. ft.
Potting soil 3.8 cu. ft.
Landscape Stone (River Rock): Pea Gravel, Playground Rice, Brown 57's 1x2", Brown 5's 2x3", Brown Gabions 4x6"